Want to “have your cake and eat it too”? With the market on a roll in 2019, is it possible to find outperforming income vehicles which are still selling at a discount? As a matter of fact, it is. You just have to look in the nooks and crannies of the market. In this case, we visited the world of closed-end funds – CEFs, which can sell for a premium or a discount to their net asset values, or NAV. Our journey took a few twists and turns – we began by looking for utilities which might be undervalued, being inspired by the resurgence of this sector in 2019, thanks to the Fed becoming increasingly dovish in its rate hike stance. But rather than stake a claim on just three individual utility stocks, we checked out CEFs to see if we could find some undervalued proxies for that sector. The three we came up with are: Duff & Phelps Global Utility Income Fund (DPG), the not very succinctly named Macquarie/First Trust Global Infrastructure Utilities Dividend & Income Fund (MFD), and the Macquarie Global Infrastructure Total Return Fund (MGU). 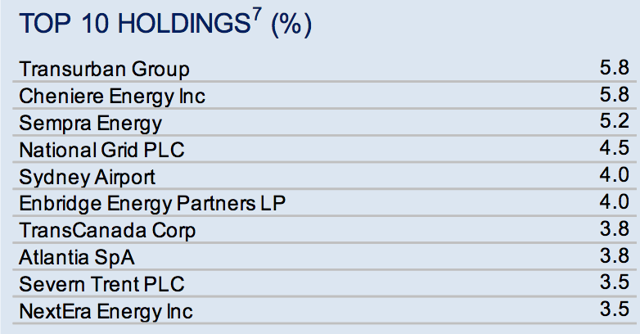 DPG is the largest of the three funds, with ~$900M in net assets. 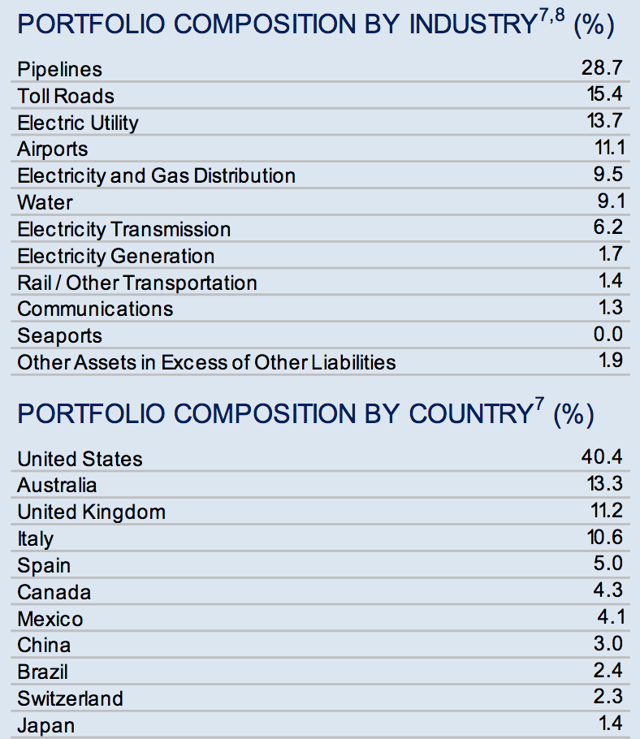 It also has the highest concentration of US equities, at 55.5%, but the lowest concentration of utilities, at 38.8%. Like the other funds, DPG’s second highest sector concentration is energy-related. DPG also uses leverage, of 30.92%, to goose its returns, and its expense percent is at 2.97%, very close to MFD’s 3.04% ratio. 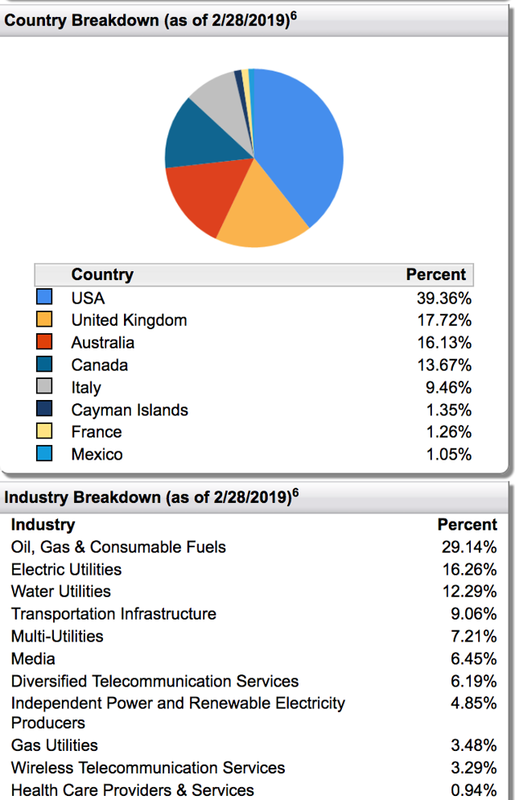 MFD is the smallest of the group, with $137M in net assets, but it has the highest concentration of utilities, at 44.09%, with oil and gas being its second highest sector, at 29.14%. DPG’s top holdings are spread out into four sectors – utilities, oil and gas storage/transportation, telecoms, and infrastructure. Utility heavyweight NextEra Energy (NEE) is in the top spot, followed by Spanish multi-national Iberdrola Canadian stock Emera (OTCPK:EMRAF) and US-based AEP (AEP) and Evergy (EVRG). MFD has more UK stocks in its mix, 17.72%, with Australia, 16.13%, and Canada, 13.67%, all comprising the bulk of its non-US holdings. MFD has the highest yield of the group, at 10.88%, followed by DPG, at 9.26%, and MGU, at 7.49%. 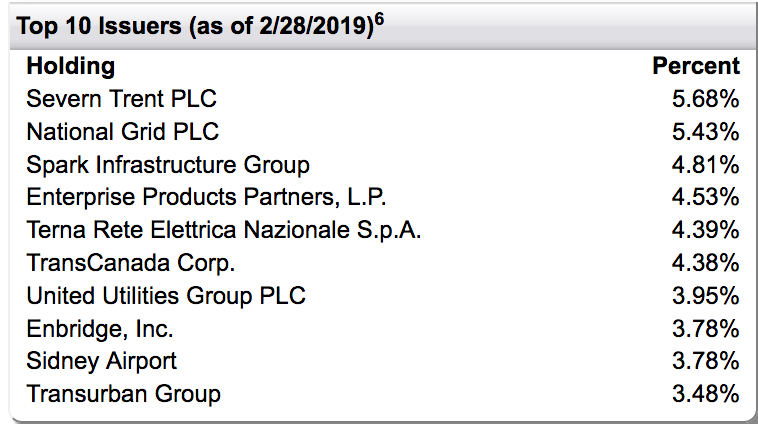 These certainly aren’t big dividend growth plays – five-year dividend growth ranges from -2.86% for MFD, to just 3.86% for MGU. All three funds pay quarterly. MFD had the highest percent of tax deferral in its 2018 payouts, with 21.53% return of capital, followed by MGU, at 12.91%, while DPG had no return of capital. All three funds issue 1099s to investors at tax time. We’ve often seen CEF’s selling at a discount to NAV in the past, but they’ve also had negative returns on NAV since their inception. This isn’t the case with these three funds, which have returned 6.09% to 7.41% on NAV since their inceptions. DPC has the highest return on NAV over the past year, at 21.49%, vs. 12.42% for MGU, and 7.63% for MFD. All three funds have outperformed the S&P 500 in 2019 by a wide margin and also outperformed in the past six months, which includes the Q4 2018 pullback, with MGU and DPG up the most during the half year. Over the past month, DPG and MGU have performed the best, while MFD has lagged the market. We rate MGU as a buy, based upon its higher percent of US equities, much larger discount to NAV, (MGU’s discount is slightly higher than its one-year average). 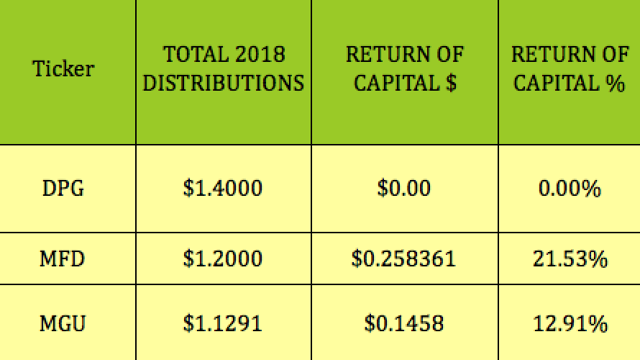 MGU also has a positive $.1404 undistributed net investment income – UNII – of $.1404, the highest in the group, vs. a -$1.09 UNII for DPG, and the lowest expense ratio, 2.60%. But, as you can see from the table below, it’s not a clear case for picking MGU over MFD and DPG – they all have some positive attributes. MFD has a much higher yield, at 10.88%, and positive UNII, but a smaller NAV -3.75% discount. DPG also has a higher yield, the best return on NAV, and the best YTF performance, but negative UNII. Disclosure: I am/we are long MGU. I wrote this article myself, and it expresses my own opinions. I am not receiving compensation for it (other than from Seeking Alpha). I have no business relationship with any company whose stock is mentioned in this article. Additional disclosure: CLARIFICATION: Our www.DoubleDividendStocks.com investing site, has been increasing subscribers’ yields via selling options on high dividend stocks for over 10 years.